We are very pleased with the agility and flexibility of AWS to date. As we progress on our core legacy system rebuild, we have every intention of continuing our commitment to deployment and operation with AWS. Loyalty New Zealand owns and runs Fly Buys, New Zealand’s largest rewards program. More than 2.4 million customers earn Fly Buys points that can be redeemed for goods and services from the Fly Buys online rewards store. In issuing nearly half a billion Fly Buys points each year, Loyalty New Zealand, which operates out of Wellington and Auckland, processes more than 100 million transactions representing over NZ$11 billion (US$7 billion) of retail spend through its collection of 55 merchant businesses. In addition, Loyalty New Zealand provides data and analytics services to the Fly Buy rewards program, Fly Buys merchants, and other customers through its full-service data and analytics business, Lab360. Loyalty New Zealand historically relied on its legacy one-size-fits-all proprietary systems for transactions, customer relationship management, rewards management, and other Fly Buys program activities. Over time, the legacy systems were inadequate to meet changing customer and merchant needs. In early 2014, the team began defining and implementing a new three-year strategy for the business. For the execution of this strategy to be possible, Loyalty New Zealand had to shift to a customer-centric view. Fundamental changes to the rewards program, including moving away from “a person is a card” data structure to a multi-account, multi-member, and multi-token system prompted Loyalty New Zealand to take a new approach to infrastructure. These difficulties were compounded by the fact that deployment of infrastructure and platform components through a traditional outsourced IT partner model meant significant lead time for change was required, often up to three months. Applications would be built, tested, and ready for release only to wait for infrastructure to become available. Having already committed to a wider business transformation, Loyalty New Zealand decided to undertake a multiyear core loyalty technology refresh program. The business decided to rewrite and redeploy its core loyalty systems on a modern architecture of public cloud infrastructure and services, application programming interfaces (APIs), and multi-tenancy leveraging the ubiquity and prevalence of the Fly Buys identifier. Loyalty New Zealand evaluated two leading public cloud providers and decided to work with Amazon Web Services (AWS) in September 2014. The business started running Fly Buys New Zealand on LoyaltyCloud in AWS in November 2014 and in doing so, opted against migrating its legacy systems into the cloud and instead launched LoyaltyCloud as a green-field project. “Our biggest considerations were around speed. This included how quickly we could execute our plans to transform our business, how quickly we could deploy technology, and how quickly we could scale,” says O’Brien. Loyalty New Zealand’s other criteria included minimizing disruption to a technology workforce skilled in open source technologies such as Linux, Ruby, and PostgreSQL. Since the launch, Loyalty New Zealand’s technology team has continued to upgrade and enhance LoyaltyCloud through its commitment to Continuous Integration/Continuous Deployment (CI/CD) and its DevOps team. In parallel, Loyalty New Zealand’s operations team has on-boarded numerous Fly Buys merchants directly onto LoyaltyCloud, including Hotels.com and glasses and contacts retailer Clearly Contacts. The business is now running in a dual AWS architecture, including Amazon Simple Storage Service (Amazon S3) for program assets, and the LoyaltyCloud infrastructure in the Amazon Asia Pacific (Sydney) region. 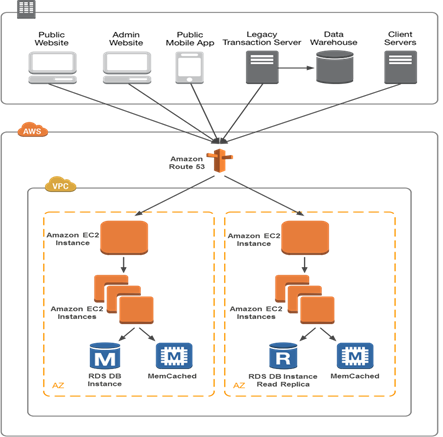 This infrastructure comprises Amazon Elastic Compute Cloud (Amazon EC2) instances delivering compute resources that run Docker, which lets developers build, run, test, and deploy distributed applications based on Linux containers. The company also uses some of its own frameworks to manage service design and execution for authentication, logging, and other functions. The relational database that supports LoyaltyCloud operates in Amazon Relational Database Service (Amazon RDS). Amazon Route 53 redirects LoyaltyCloud’s URLs to proxy servers running in Amazon EC2 instances that are distributed across multiple Availability Zones to minimize the risk of service disruption. Loyalty New Zealand has opened its own APIs to enable merchants to consume the LoyaltyCloud. “Initially there was a view that opening out our APIs to merchants would significantly speed up transaction processing and real-time balances," says O’Brien. "Although this is completely true, it's only part of the story. The platform we are building in LoyaltyCloud not only enables rich customer experiences in our own channels but in our merchants’ channels as well.” Loyalty New Zealand aimed to build and support its AWS architecture largely by using its highly experienced software engineering and DevOps teams. However, the business also conferred with AWS solution architects based in Wellington, who provided reviews and detailed feedback on architecture and implementation. “The local AWS representatives gave us peace of mind that our approach was well thought out, fit for purpose, and in alignment with implementations they were familiar with,” says O’Brien. Loyalty New Zealand can now provision new, fully configured Amazon EC2 instances in less than 15 minutes instead of waiting up to three months for its previous managed service provider to deliver similar capability, vastly improving its speed and agility. The business anticipates that by early 2016, it will increase the number of annual transactions captured in AWS from a few million to 100 million, and O’Brien is confident that AWS can scale to support the rise. The core technology transformation program has had a massive impact on the business and technology functions at Loyalty New Zealand, which are governed by steering committees that include the heads of its product, operations, and architecture teams, as well as merchants that O’Brien sponsors on behalf of the executive team. O’Brien also briefs the organization’s executive team weekly on developments such as the adoption of AWS and the ongoing benefits the cloud is delivering. To learn more about how AWS can help your Big Data needs, visit our Big Data details page.